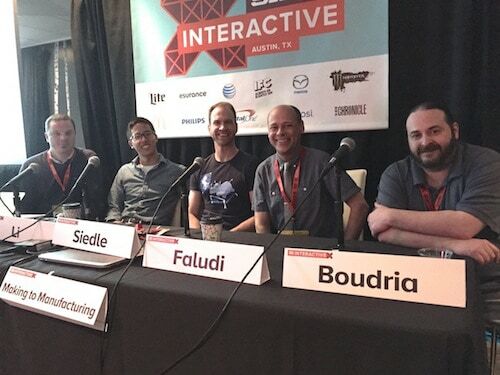 I was honored to share the stage at SXSW with Sparkfun CEO Nathan Seidle, Silicon Labs’ Peter Vancorenland, Chaotic Moon’s Marc Boudria, and Atlas Wearables’ Peter Li in a panel discussion called ”Making to Manufacturing“ at SX Create. This panel brought together technology veterans to share our triumphs, failures and offer words of wisdom to fellow makers. We focused on the common hurdles entrepreneurs must overcome while taking their hardware creation to full-scale production. The conversation revolved around the best ways to prototype, what tools to use, creative funding sources, selecting partners and the best ways to manufacture hardware. Quality control, proper pricing and the importance of developing a great sales team was stressed. With over 145 attendees, it was standing room only, and the best attended event at SX Create! Special thanks to Silicon Labs for hosting the panel and gathering a great cast of speakers. Check out their blog post to see more photos and tweets as well as all the Q&A from the session!